For the cool city mom, I have found a super stylish stroller that is great for every event: strolling the city, jogging the park, running your errands, or traveling the word. It’s the Urban Jungle Luxury Collection stroller from Mountain Buggy. 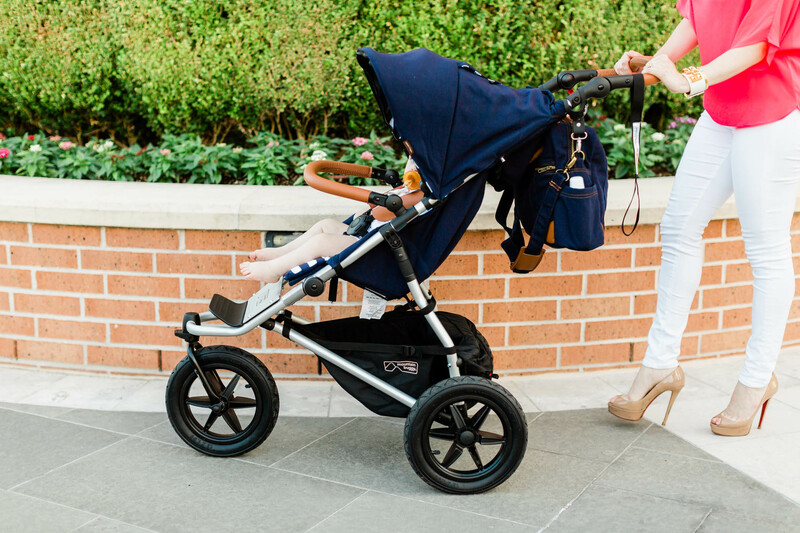 This stroller is available in Nautical and Pepita and it offers refined styling and luxury aesthetic. With its posh look and great design, it’s perfect for the chic mom on-the-go. I’ve tested out the nautical version and am sharing 14 things that stand out to me with this chic urban stroller. I’m all about an easy fold on a stroller. If I have a diaper bag on one shoulder and my kid on the other hip, the easier the fold the better. The fold wasn’t as obvious with this stroller, but once I found the handle and button under the stroller seat, just lift the seat, press the button and turn the handle and voila–the stroller easily folds and you can do it one-handed! Just make sure that the canopy is back, the bumper bar is pulled up, and the handle bar is down before folding. The same thing applies when unfolding it. Press the same button and turn the handle to smoothly open the stroller. When investing in a stroller, I am particularly fond of the ones that can grow with my family. This Urban Jungle Luxury Collection stroller is compatible with their car seat (so it can become a travel system), their new carrycot plus (suitable from newborn to 6 months), as well as their freerider stroller board for older siblings to ride along. It’s great that it can be used from day one with baby and beyond. A cool feature with this stroller is the brake. Most strollers have a pedal break near the back wheels, but this stroller has a handbrake right on the handlebar. It’s convenient and easy to use and navigate with the green “go” and red “stop” locators. My son loves to face forward in a stroller and see where we are headed, but I like to take a peek every now and then to check on him to make sure he is okay. I like that this stroller has a magnetic peek-a-boo opening on the canopy, which means no sound and no fuss when sneaking a peek. With a front wheel that swivels and locks straight just with a press of a lever, you can take this stylish stroller anywhere on all terrains. It’s a great jogging stroller (I know, I tested it!) and the locking front wheel helps this stroller stay on course with you during your run. Speaking of wheels, one of my favorite things about this stroller are the 12″ air tires and the suspension. This stroller rides so smoothly and can easily hop on any curb. My son and I have enjoyed this stroller each time we’ve used it because it can handle any terrain and makes it a smooth ride for him and me! Whether you are going on a run at the park, strolling on the beach, walking the pebble streets, this stroller can easily handle it all. If baby is getting tired and needs to lie down, no problem! The Urban Jungle Luxury Collection goes from upright to lying flat and every angle in-between easily. Just like their nano duo that I reviewed, all you have to do is pull the toggle and adjust the recline. But again, this one can lie all the way back! If you are going on a run with this stroller and baby, you don’t want the stroller to run ahead of you. That can be very dangerous. This stroller has a runaway strap around the handlebar that you can use to make sure baby and the stroller stay close. I also love that the handlebar easily adjusts to different heights (perfect for tall couples, too) so it makes it a more comfortable push for you. In my opinion, every stroller should have a 5-point harness, and this stroller has a good one! I really like that this harness requires just one push of the button to release, and the reload is simple by clicking in one at a time. You can also adjust the stroller crotch strap to suit the comfort of your growing child. Depending on the size of your child or what they prefer, you can extend the leg rest for your child’s comfort by pulling out the retractable bar located underneath the seat. Legs up or legs down, your baby has a choice! I love that the Urban Jungle Luxury Collection comes with a convenient cup holder, which is great for holding your bottled water or another drink on-the-go. For that extra touch of style, this stroller has beautiful tailoring and hand-stitched bonded leather detailing on the handlebar, grab bar and labeling. It really makes this stroller look super chic. Wanting to switch up your look? With the Urban Jungle Luxury Collection you can! The liners are actually reversible! On one side you have this stylish nautical print and on the other side you have a solid navy liner. This is a great way to personalize the look of your stroller. The basket under the stroller is a great size and has a 22 lb. storage capacity. I love that it also has pockets for even better, more organized and easier to find storage. built in “gate checked” tag that enables parents to take their stroller straight to the gate — so cool!! a great option for travel, even without a stroller – just use as your usual suitcase! Click here to purchase the travel bag! If you’re looking for a stylish stroller that will meet your urban needs, Urban Jungle Luxury Collection is the one for you. Click here to purchase yours!